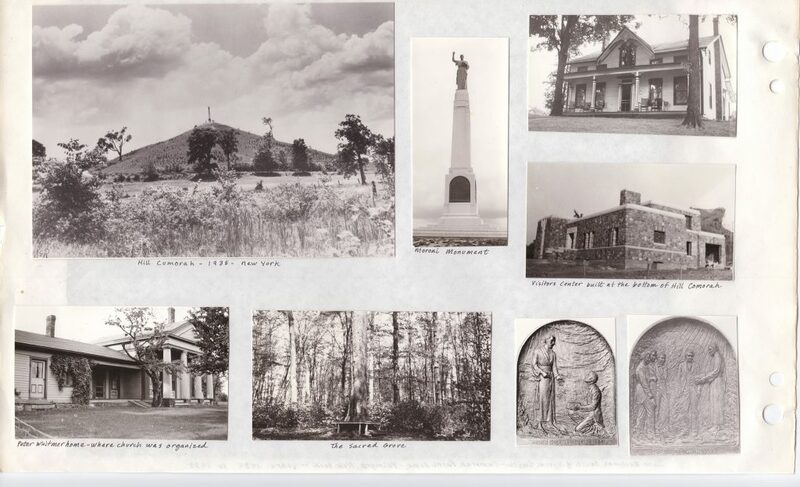 A recent article on lds.org, Reclaiming Hill Cumorah1, prompted us to share some sources related to Hill Cumorah, its monument, and pageant beginnings. 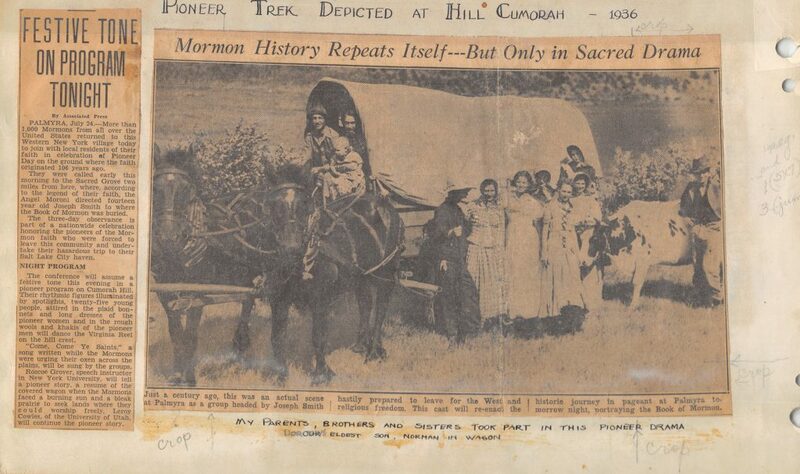 Our grandmother Dorothy Smith Clark’s papers reveal her connections to Cumorah through her parents Hyrum and June Bushman Smith, who were missionaries at the Cumorah Farm from 1935 to 1939, and her friend Torleif Knaphus, who sculpted the Hill Cumorah monument. In searching Dorothy’s diaries and letters on her Kindex archive, we are able to provide insight to our family’s connection to this historic sight. Went by Orem Electric to annual Springville Art Exhibit with T.S. Knaphus, sculptor. Spent 3 hours in Provo, sight-seeing on our way back to S.L.C. Took kodak snaps on B.Y.U. campus. This was a very interesting day for me and rather an outstanding one I suppose, inasmuch as I was so kindly favored and well treated by one so prominent in his sphere. Was invited to Knaphus studio this evening where be showed me a newly-designed model of the shaft for the Hill Cumorah Monument. We ate some ice-cream there and talked of my doing some more painting there and maybe helping him with some new panels. Thrilled about getting into that work again. I have Christmas card orders to fill for Torleif S. Knaphus in return for clay which he gave me for modeling. He certainly has inspired me and been a great help in pushing me, as it were, along the road to accomplishment. I don’t know many other grown people who have so influenced me to good and been as companionable. Attended night class tonite and made my first water color scene (copy of Moser’s) in new style (from my former teachings.) Mr. Knaphus met me after work – asked me to go to Beaux Arts Ball this Saturday but I declined. 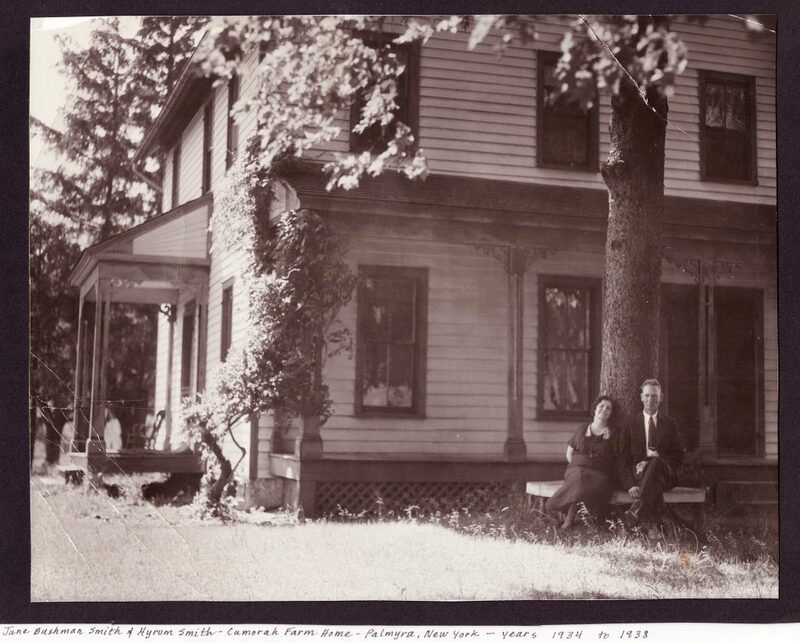 Although she didn’t attend the dance with Torleif, their close friendship often proved difficult for Ellsworth during his absence while serving as a missionary. On a temple trip to Manti that included the Knaphus family, Dorothy played an April Fool’s joke on Ellsworth and wrote to him that she and Torleif decided on a whim to be sealed there. Practical jokes notwithstanding, Dorothy and Ellsworth married in August 1934. 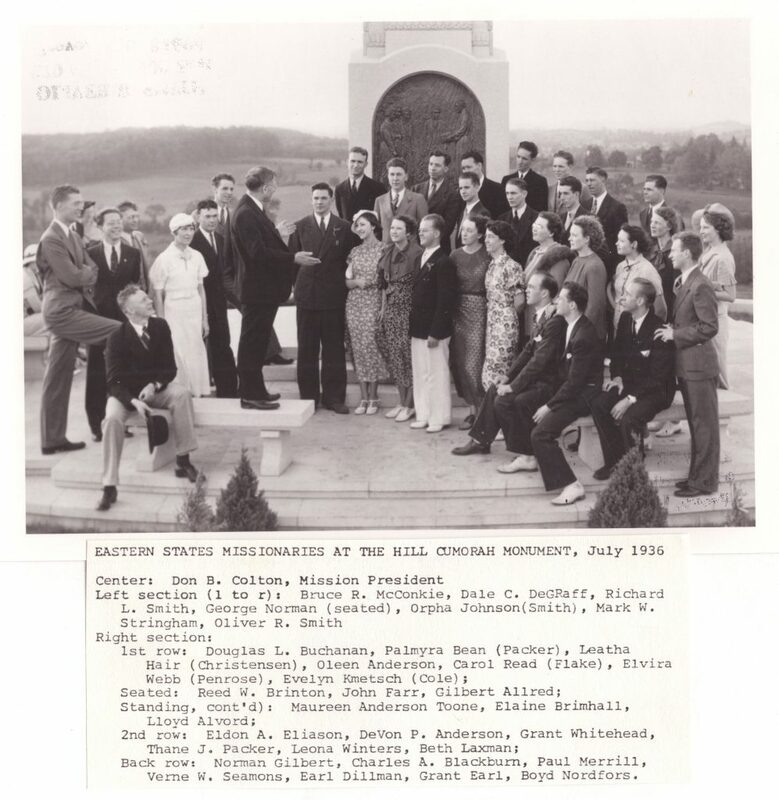 That same summer, Dorothy’s parents Hyrum and June Bushman Smith were called to be missionaries at the Cumorah Farm. 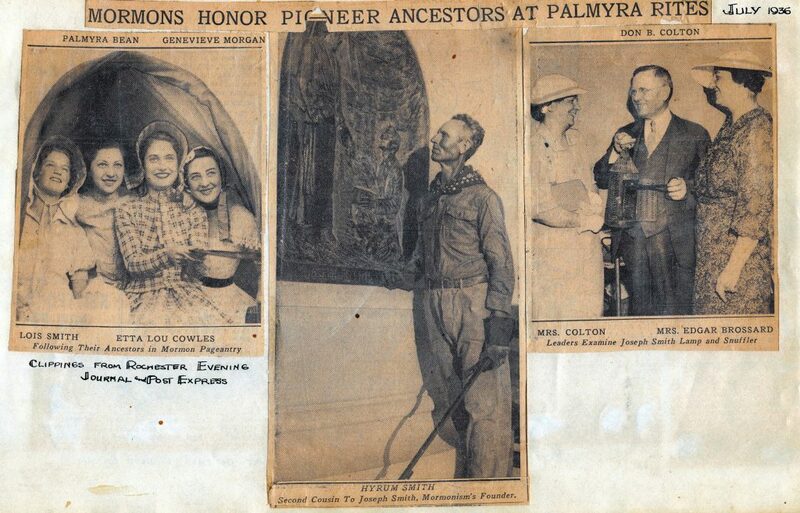 After their marriage, Dorothy and Ellsworth moved to Idaho, but Torleif’s connection to the family remained as he completed the monument and attended its dedication in July 1935. Over the next year, Dorothy regularly wrote to her family in Palmyra, discussing plans for the Moroni monument dedication and future pageant. In her letters, Dorothy sketched out ideas for local advertisements for the pageant. Along with 37 other missionaries of the Easter States mission I am engaged in a special drive in the area within a 20-mile radius of Palmyra, which will continue until the dedication of the Cumorah Monument on July 21. We hope to do some good work by this concentration of effort, which has significance with the connection of the monument. We are visiting every home—rural and urban—in the section. Eleven of us stay together at the LDS hall in Palmyra and drive out 5 or 10 miles every morning to a rural section in which we go tracting until late afternoon, when we return. Our week-ends I have visited Rochester and Buffalo for publicity work. At Buffalo I stayed at Mary Payne Chamber’s place. She has three children. Girl 11, girl 9, and boy 7…. Hyrum Smith (center) standing at the base of the monument. He is a first cousin once removed to Joseph Smith, and served as Torleif’s model for Joseph Smith in this panel. Note Hyrum Smith is a first cousin once removed to Joseph Smith Jr., not a second cousin as the caption indicates. 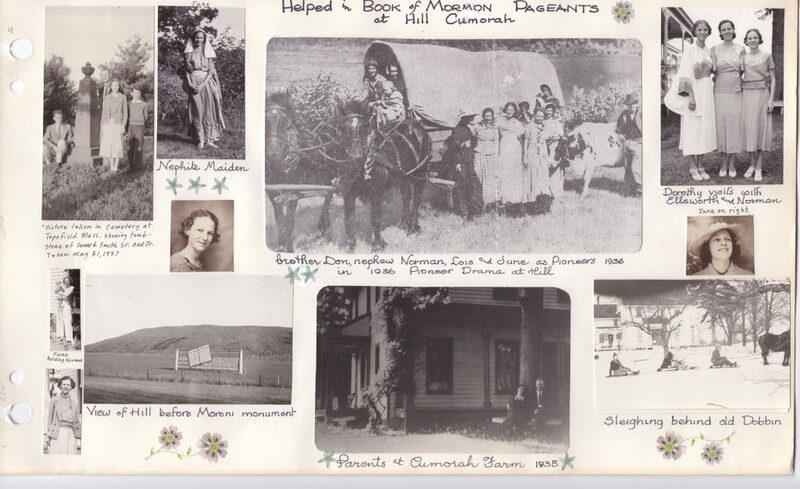 Thanks for sharing this wonderful bit of history involving my sweet Aunt Dorothy, Uncle Ellsworth, and my grandparents, Hyrum and June. I am Don’s daughter, Amy June Smith Whetten.